Things are getting closer and I'm trying to do all the things before Hank arrives. This included online meetings with boss besties, photography classes, and photo reveal meetings for clients. I ended week 34 prepping to shoot team photos for the 6th year for the North Country Heart Walk. My awesome mother-in-law assisted me with set up and getting teams prepped for their photos. This week was one of the busiest to date. I keep saying I will slow down but anyone that knows me knows that might be impossible. Well until Hank arrives, then sleep depervation might slow me slightly.. haha.. I'm hoping it's slightly. Nesting is real life.. and I kind of love it. I'm making labels, reorganizing my craft and art supplies, clothes... Martha Stewart has nothing on a pregnant woman that's nesting. While organizing my stuff, I found these sunglasses from a billion years ago when they where a thing. I called them my Aaliyah glasses. I can still sing and rap all the lyrics to "Back & Forth"! This album, "One in a Million" blew my mind! So much groove and killer beats thanks to the help of Timbaland and Missy Elliott. Sadly Aaliyah left us too soon. In her honor, I had fun recreating this photo in the hallway of the building that is home to my studio and help from my hubs. 35 Weeks pregnant kicked off with my Rock Concert themed baby shower! From VIP Passes, to the "Henry Ellis Band" Stage, my mother-in-law rocked out an epic event. I took the next day off work to unpack all the shower goodies with help from my sister. She washed all of Hank's clothes and helped me get the house organized. She knows my creative brain best and loves to organize so we ended up getting a lot done. Week 35's photo was taken by my hubby in the studio, and after 4 hours of playing in photoshop, I created this masterpiece holding a little guitar Auntie Sandy bought for Hank. 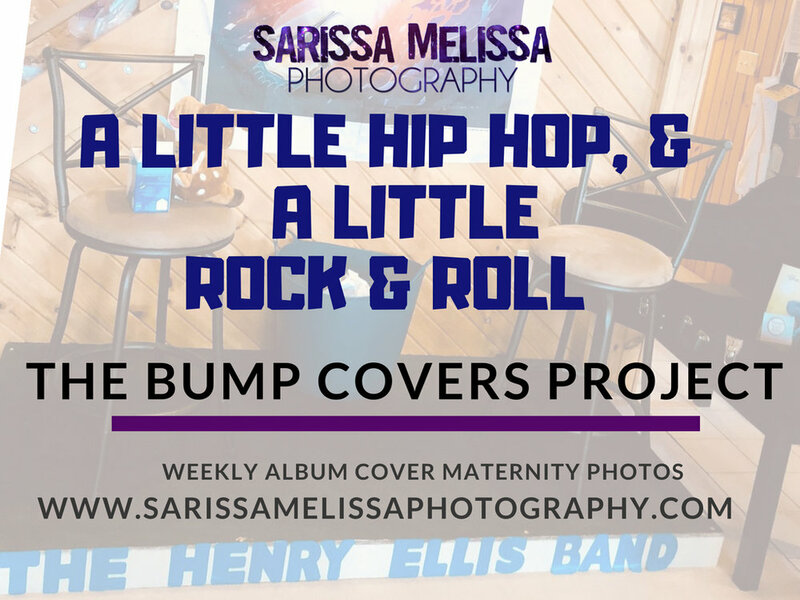 I couldn't do the big guitar thing as it would have hid my bump.. and it's rather bumpy these days!